Redd's Biergarten is still under construction but hopefully will open before the beginning of the summer. We got a look inside the new addition to Edison Place/Market Street scene and here's what we found. The main biergarten area is just inside the doors from Edison Place. The room houses biergarten-style wooden communal tables and two long bars and fits over 200 people. There will be 31 beers on tap and hundred more varieties in bottles. In the main room you'll also find details like pulley lights, bartops constructed from salvaged wood from abandoned NY buildings and a tribute wall to Newark's men of service (Police, Fire, EMTs, etc). Although beer is the main attraction in a biergarten, owner, Daniel Palsi hopes to create some buzz around it's food as well. Dan Palsi was professionally trained at the CIA (Culinary Institute of America) and further studied German food and culture in Munich. The menu will include German favorites like spatzel, shnitzel, pretzels, bratworst but will also offer specialties from their original Redd's location in Carlstadt with calamari, wings and burgers. Family-sized/sharing plates will be available as well. Patrons will be able to order at a window and get buzzed when their food is done. Midway through the building there is another smaller room to fit 70 people. The doors close to keep the room completely private for groups and private parties. The room will also be open for those that prefer getting full food/beer service, where barmaids will serve it up. Redd's will be open all 7 days opening at 11am... with a rolling closing after events. There will be a five hour Happy Hour on non-event nights from 3-8pm which will include $5 food options, beer specials and more! Dan Palsi hopes to create one-of-a-kind events, beer dinners, pig roasts and more. Redd's will also be one of the premiere destinations for NewarkPulse's fall Beer Week. We even caught a sneak peek in their basement which might bring back the former speakeasy that was housed in that location (let's get them open first and maybe see this open in a year or two)! 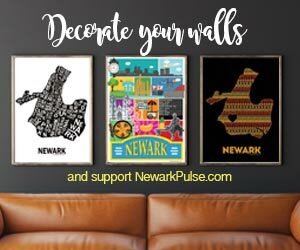 Down the long hallway from the Market Street entrance you will find a pictoral history of beer in Newark with images of Ballantine Brewery, G. Krueger Brewing Co. and Anheuser-Busch - who helped shaped the city in the early 20th Century. Like the history of beer in Newark, Redd's is backed by strong history as well. Redd's owners and brothers Doug & Dan Palsi are joined by elementary school friend, Frank Pinto and have more than 75 combined years of experience in the hospitality industry. They took over their Meadowlands location in 2002 from the Palsi parents and added a more sports bar feel to it. They are known for their shuttle service from the restaurant to the stadium on gameday. After the Devils left the Meadowlands there was a sense of loss, but the team is excited to come to Newark to reunite with their Devils fans and customers.